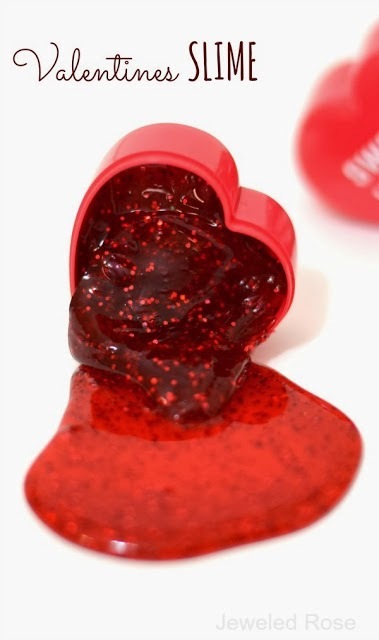 I cannot believe that tomorrow is already Valentine's Day! 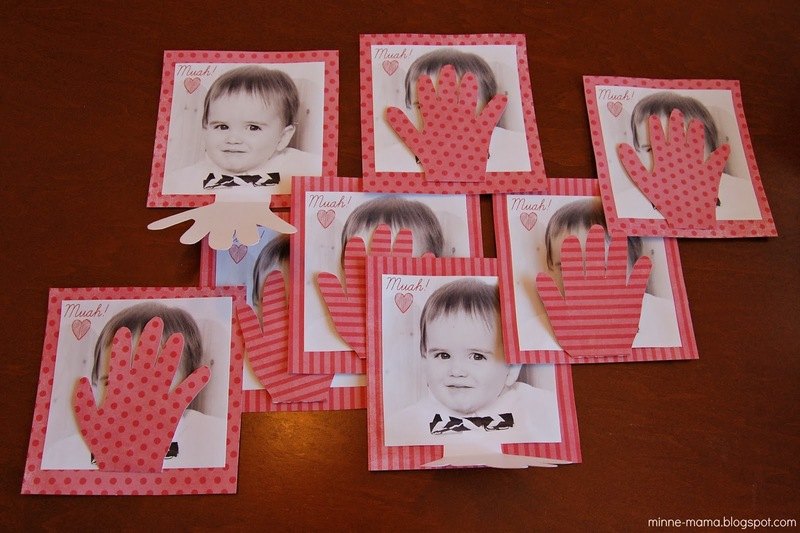 I thought it would be fun to do a roundup post of our Valentine crafts and activities as well as some of my favorites from other blogs. 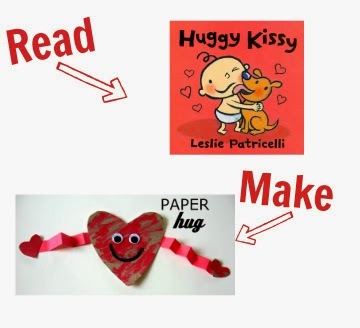 These are the Valentine themed crafts and activities we did this year, for last minute ideas or to keep in mind - or pin - for next year! 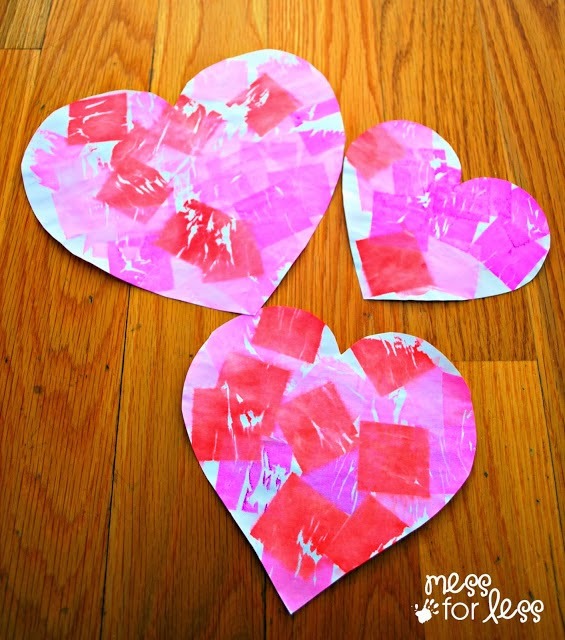 Skyler loved painting with yarn which I framed with festive heart doilies to create our sun catchers. 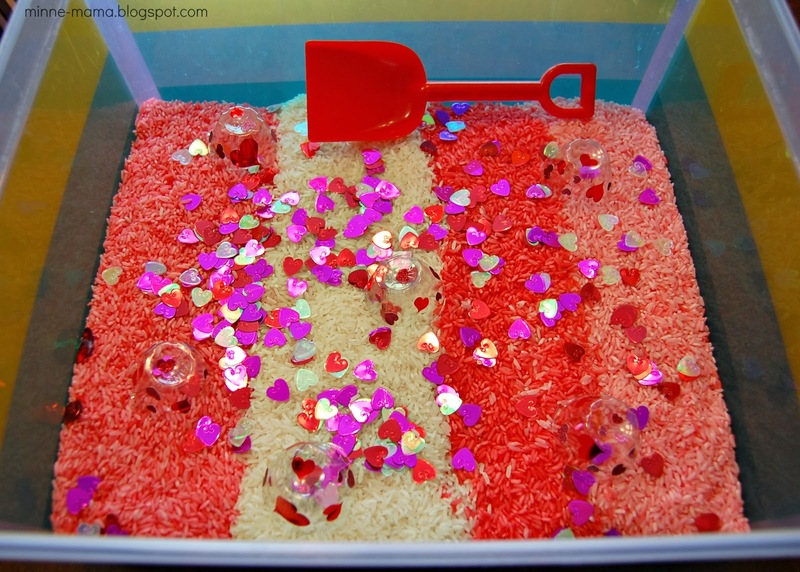 This simple dyed rice sensory bin was completed with heart sequins that are very fun to search for, and some recycled egg cartons that Skyler enjoyed decorating with heart stickers. 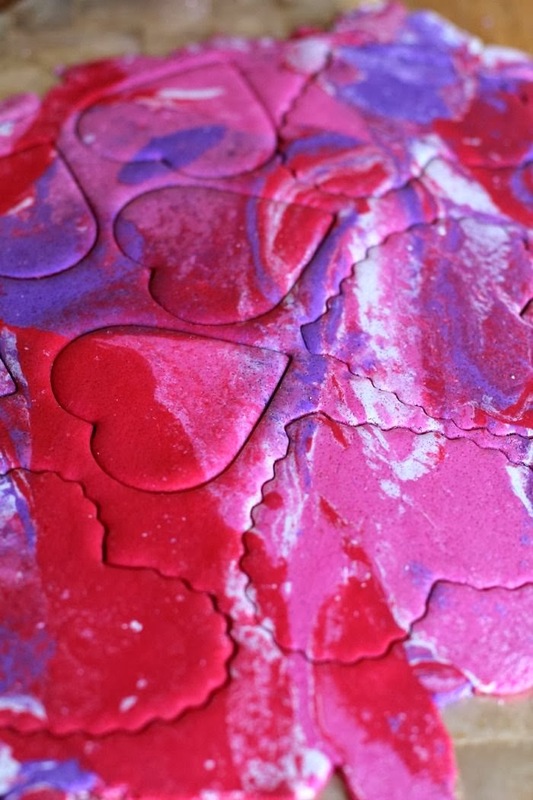 We made this simple canvas with potato stamps and a lot of glitter. 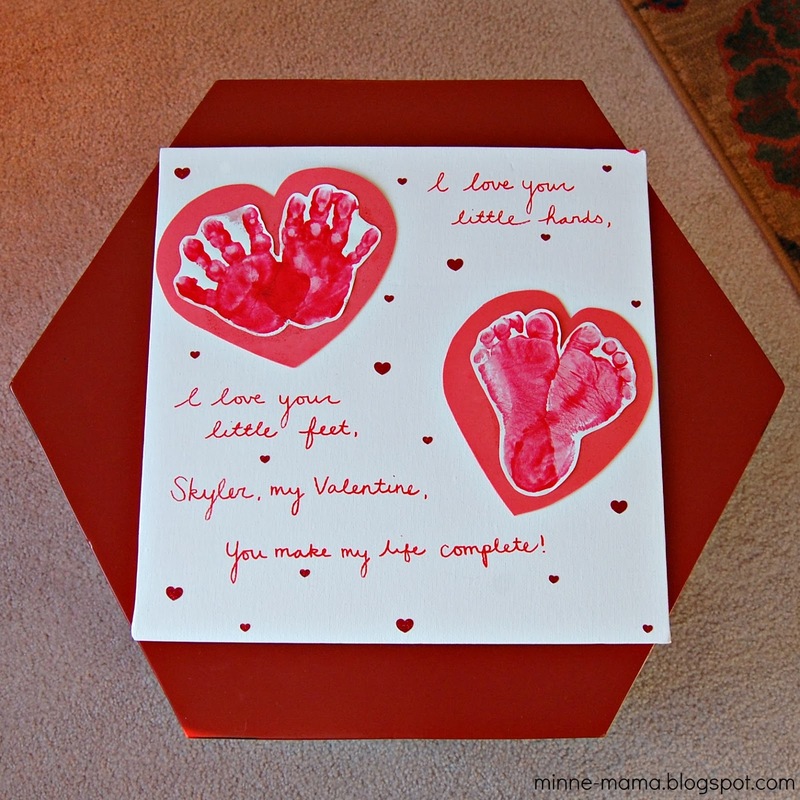 For our second canvas, Skyler made little hearts out of his hands and feet and I wrote a Valentine to my little Valentine that could easy be modified for a parent or teacher gift. 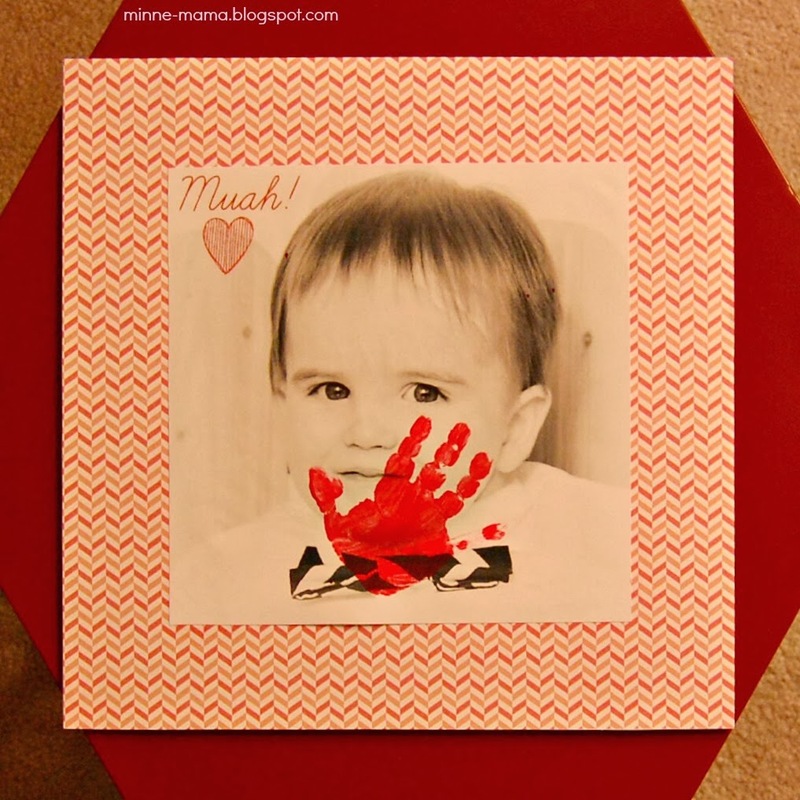 For our final canvas decoration, I printed off a picture of Skyler and he added a 'kiss' hand print. When our canvases were complete, we started filling the rest of our shelf. 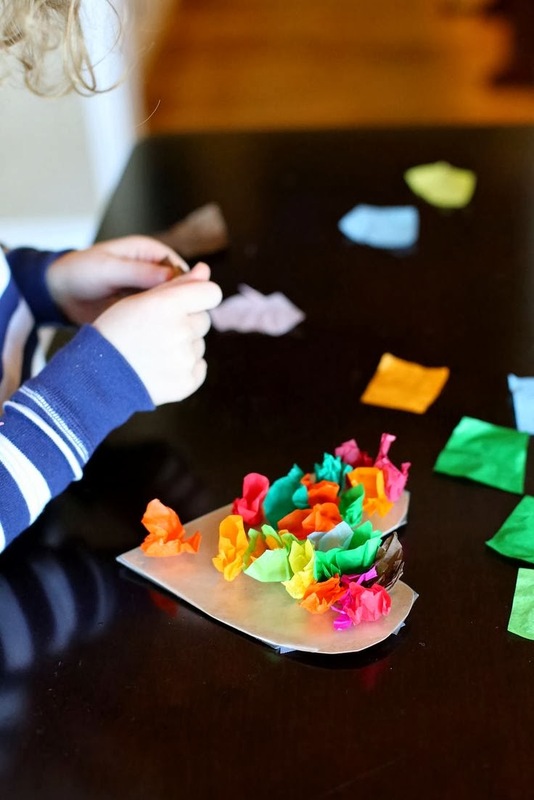 We started by making coffee filter bunting two ways. 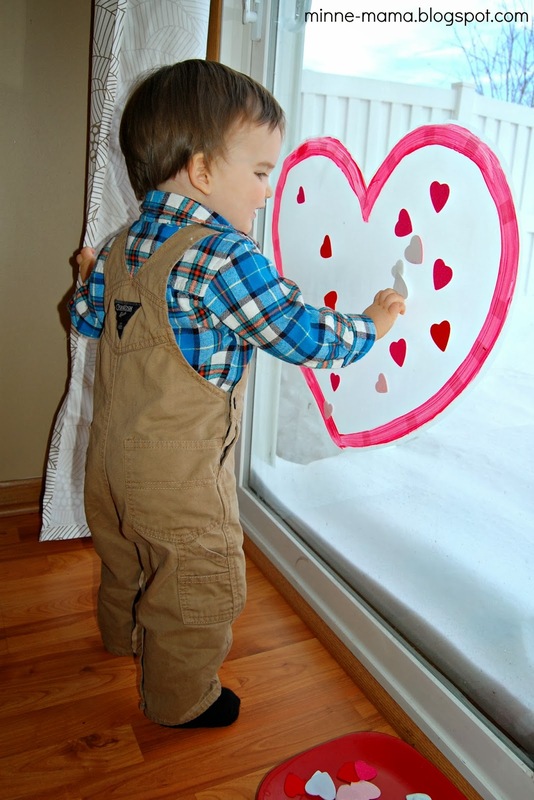 We filled our sliding glass door with a big contact paper heart that Skyler decorated with felt hearts and also with tissue paper (not pictured in the post). 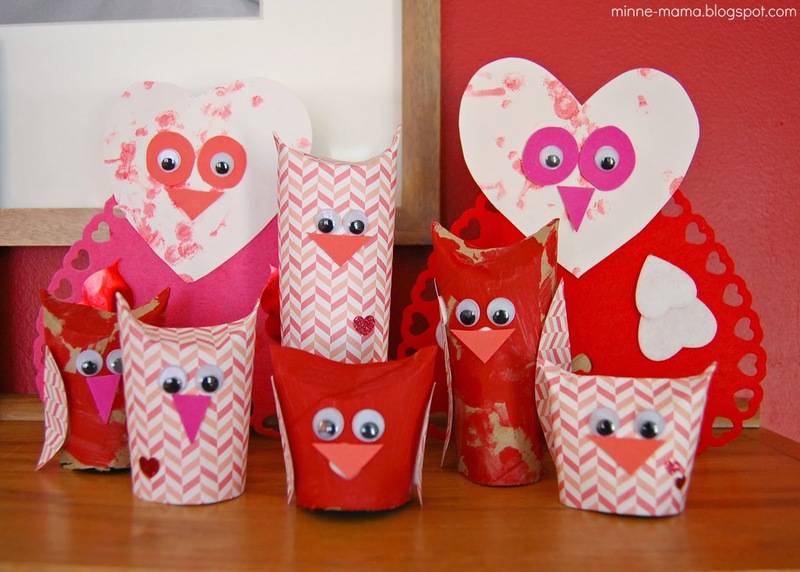 We changed out some owl figures I had on our shelf with these cute Valentine owls made with paper towel and toilet paper rolls and a huge variety of craft materials. 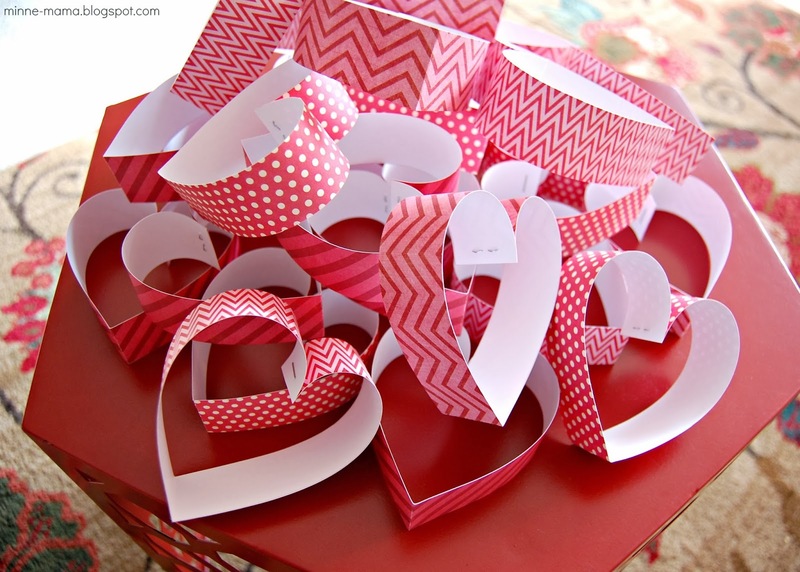 This paper heart garland would make a beautiful Valentine decoration. 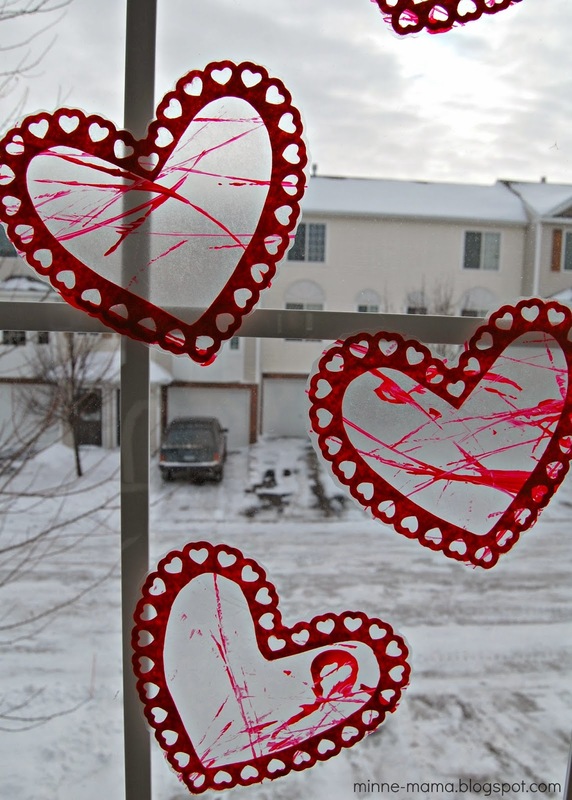 We are using our garland as a countdown and cut one heart off every day until Joe gets home from a long work trip. 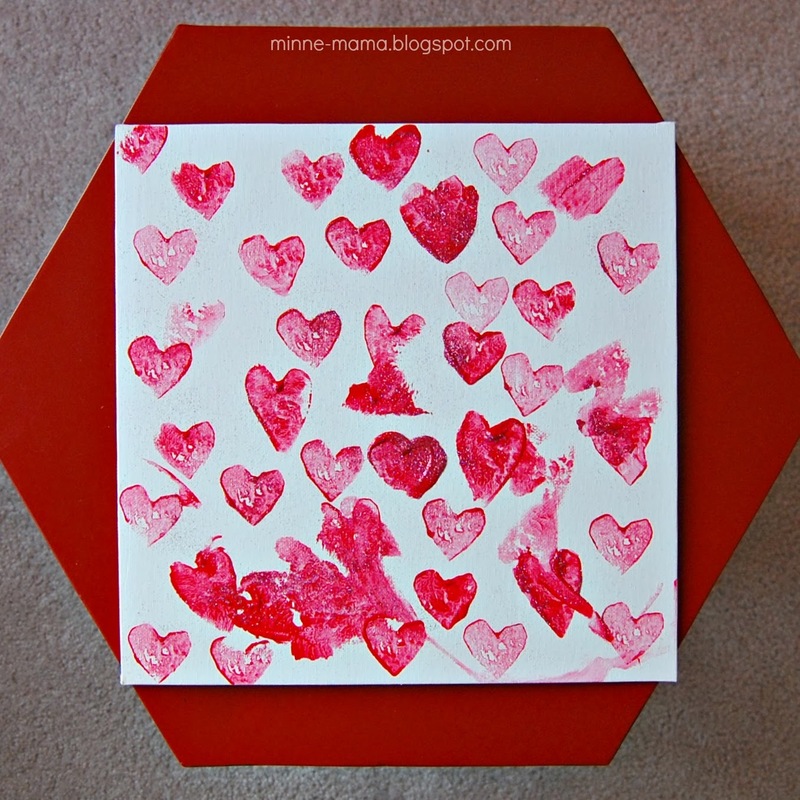 I modified our kiss canvas to make these Valentine's for Skyler's teachers. 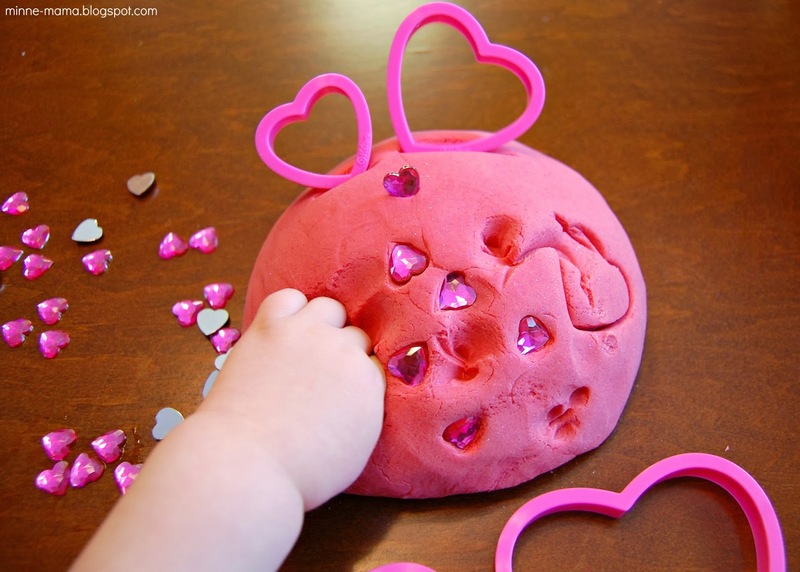 We had fun with this sparkly pink peek-a-boo play dough with little hidden hearts! 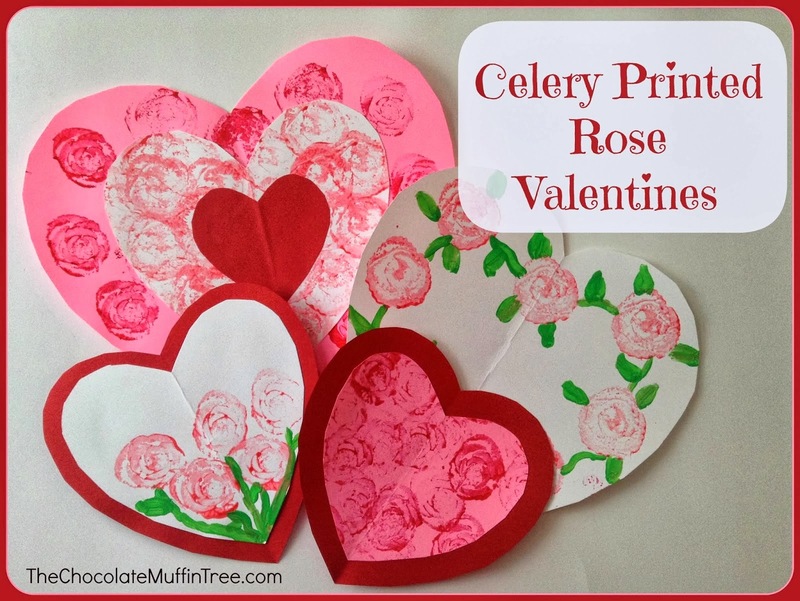 I have been filling my Valentine Pinterest board with many wonderful kids crafts and activities to remember for next year - these are some of my favorites! 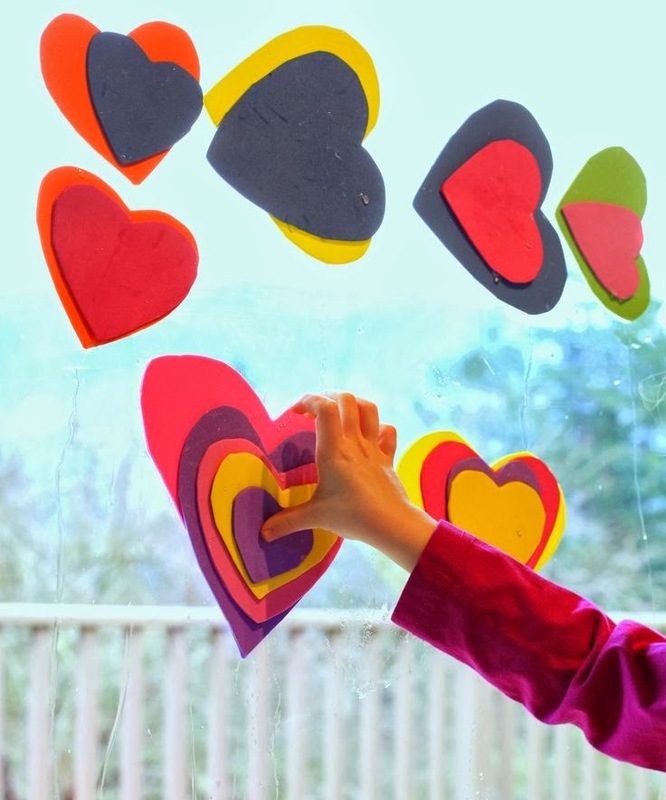 I want to have these beautiful heart mobiles from Mess For Less hanging all over our house! 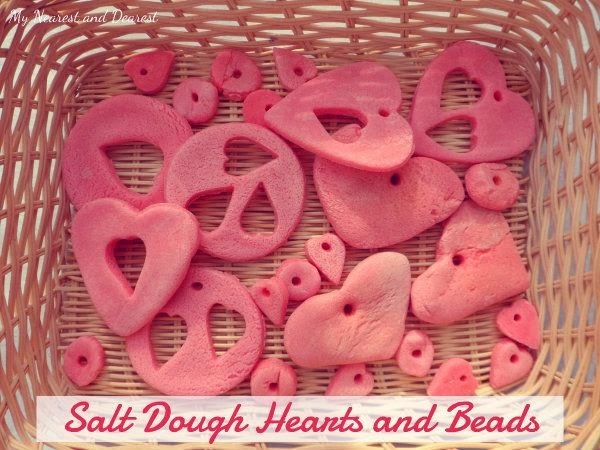 Salt dough hearts are definitely on our list for next year. We will probably do a mix of these two. 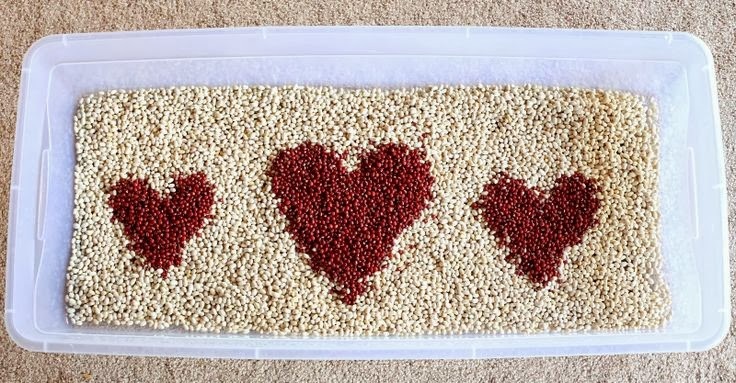 Skyler will be a great age next year to practice threading with these hearts and beads from My Nearest and Dearest! 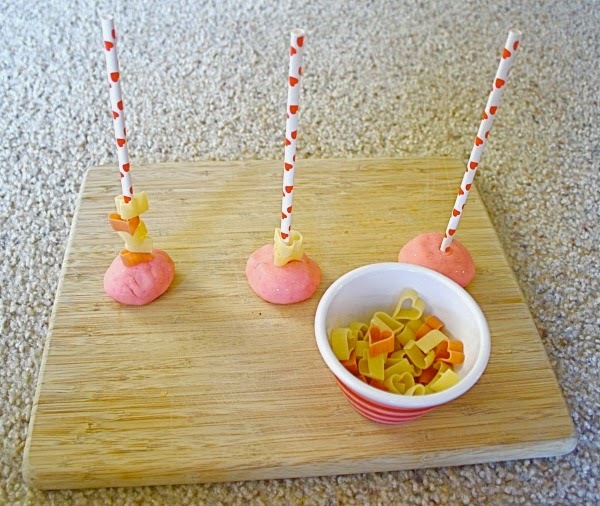 Simple heart covered straws and heart shaped pasta makes a perfect Valentine fine motor activity. I love this idea from Buggy and Buddy. 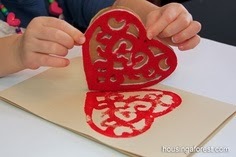 At Housing a Forest, they made Valentine stamps out of felt Christmas ornaments! I will definitely be looking at all felt Christmas ornaments next year with stamping crafts in mind. 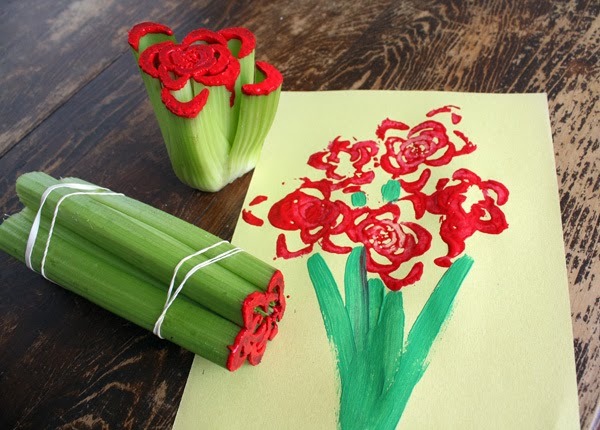 If you haven't, you must check out these great blogs, not only at these crafts and activities, but at all of their creative ideas!